After a night of getting to know each other, and an amazing breakfast of porridge courtesy of Sarah (BMF event organiser) Sunday morning saw the start of the instruction and training with a few hours of navigation theory. Cramming in to 3 hours what it takes a marine cadet 8 weeks to learn our instructor Jason managed to keep it fun, but it was important stuff we’d be using later so everyone studied hard. Was good to brush up my skills, especially as I rarely use them out on the hills and often get “lost” (as anyone who’s walked with me will confirm!). I prefer to call it “exploring” and usually find my way eventually, but now there’s no excuse for ever missing a turning again! 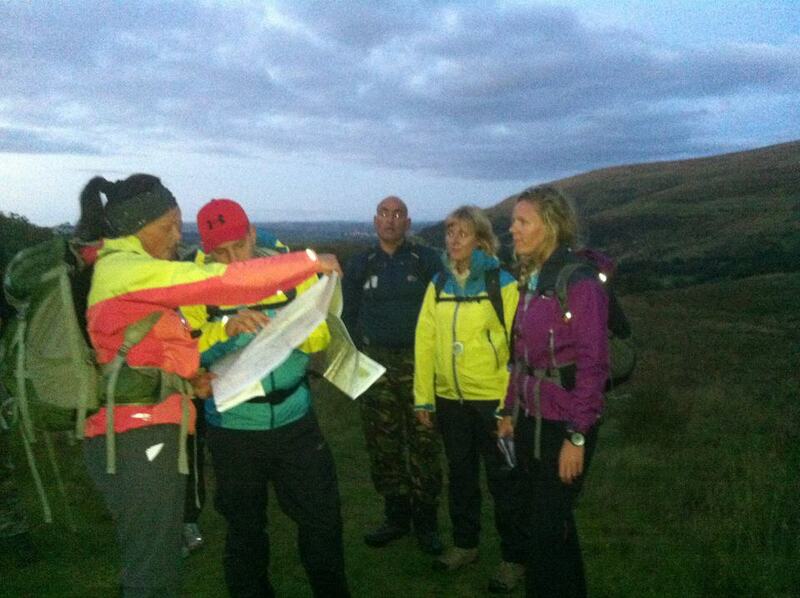 After all the theory we could handle it was time to get out, maps in hand, and see how lost we could get on Fan Fawr. Our first proper climb as a group and there was suddenly an obvious gulf in fitness and speed between those at the front and those at the back…I’m glad to say I slotted comfortably in the middle and didn’t feel too out of place. All those weeks of training must have helped a bit! We finally saw some wild ponies, which pleased Lindsay as she’d been talking about them all day and we were starting to think she’d confused sheep for horses! Navigation went well, we covered about 6km through cloud and over open ground and arrived in good time at the site of our much anticipated river crossing! We met Instructor Pete in a beautiful wooded gully with a river flowing through the bottom, and the first thing he had us do was don harnesses…excitement built! 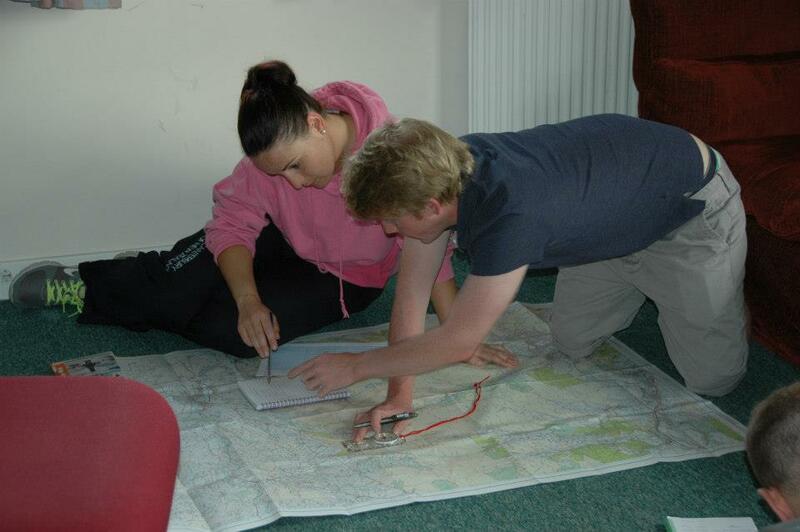 We were then shown how to rig a rope crossing to get over rivers, gorges etc. It was an amazing technique using rope, strops, carabiners, figure 8 knots and lots of team work to get everyone and all the kit cleanly across an obstacle. We were then split in to teams and the race was on! I was teamed with Stephen, Jaroslav, Rachel and Carolyne and somehow (probably because I talk too loudly!) I ended up team leader. In reality this team didn’t need leading, it took seconds to agree that Stephen was tallest and best to ford the river with the rope and set up the other side while Jaroslav was tallest on our side to get the ropes right up in the tree. 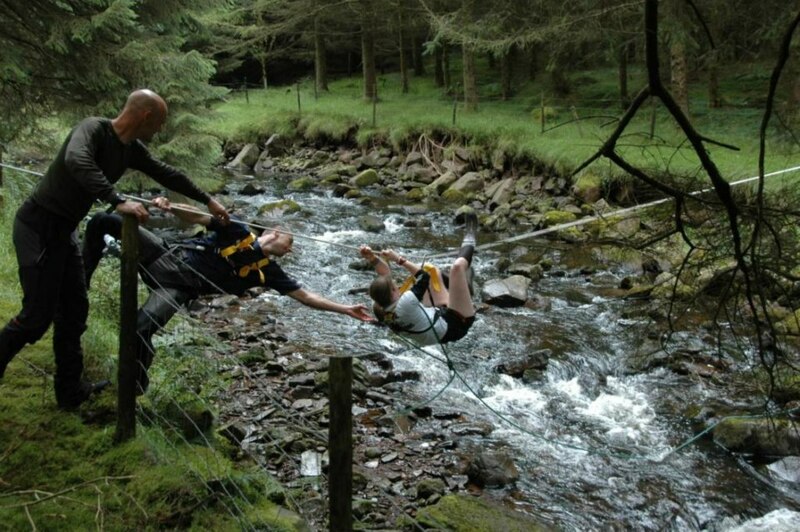 The communication between us was excellent, or maybe we just all liked shouting, but before long we had our ropes up and were lifting team members and clipping them in to caribiners to slide them over the river until there was just me left (leader goes last). I checked the rope set up to make sure we could pull it all across after me and went to hook on…disaster! The rest of the team had harnesses with carabiners on their chests, mine was a standard harness, carabiner at my waist, and I’m not exactly the tallest of chaps! (not the shortest either, Barry gets that prize!). A moment’s panic when I couldn’t get near the rope but I eventually managed to climb up a barbwire fence and balance long enough to get hooked on and launch across the water. 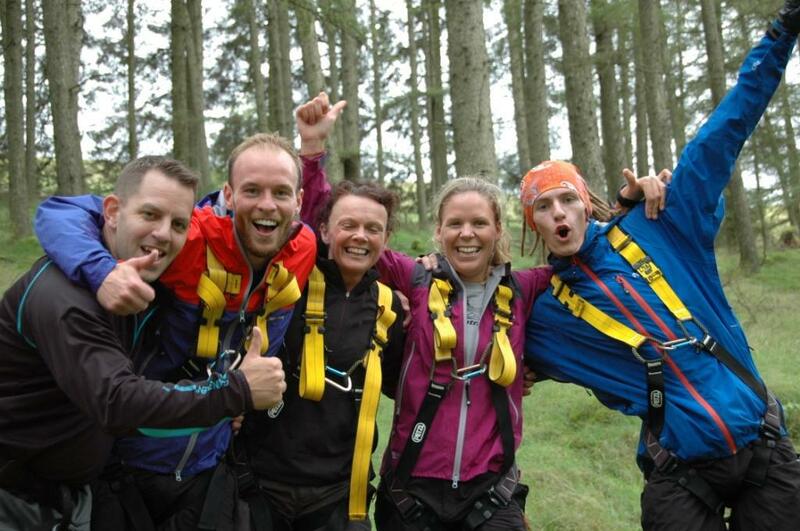 We pulled across our ropes and somehow managed to completed the challenge ahead of the other team, winners! It soon became clear we were going to have to race back across again and without making the same mistakes we won for the second time. Not sure how quickly the professionals could have done it, but I’d happily go into battle with my team any day. Me and the winning team of Stephen, Carolyne, Rachel and Jaroslav. That night we were in for a real test of our navigation skills as we ventured out on to Fan Frynych just as darkness fell. Watching the moon rise over Pen-y-fan and walking without torches was an incredible experience, unfortunately some of the navigation wasn’t quite as impressive. Thanks to some pertinent questions from Instructor Pete (are you sure this is the cairn you’re looking for? How many paces till the next turning? Is the map the right way up?!?) we followed the route but it took a while. Was a great opportunity to chat with Nicole and Anna, the two organisers of the experience, and a timely reminder of the importance of careful navigation! Navigation as the moon rises, checking the map with Carolyne while Nicole and Rachel wait for directions. Pete watches on, marveling at our bad decision making! We made it back to base around 11pm, too late for a beer, and I after a gentle ribbing from the others (who had covered the course 40 minutes quicker than us!) I was to my bed to rest up ready for another fun-filled and challenging day ahead. 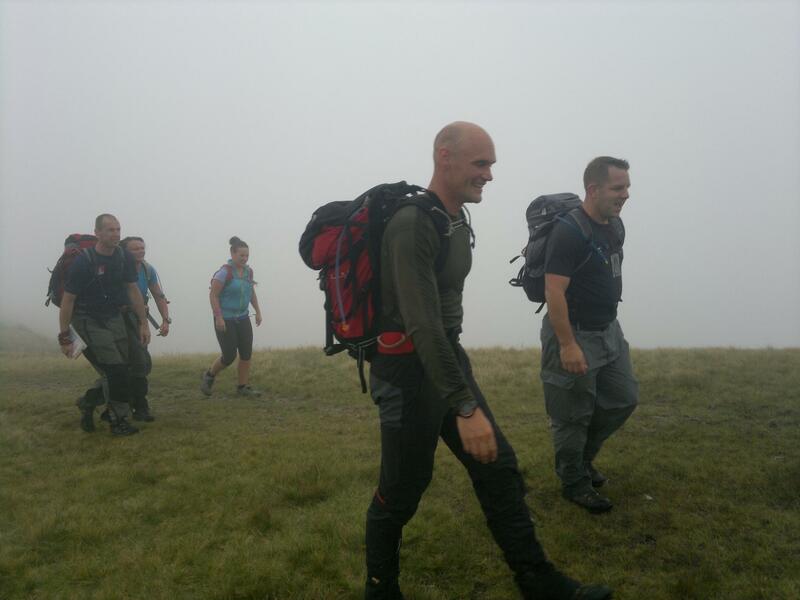 This entry was posted in Events, Mountain, Training and tagged Berghaus, Brecon, challenge, fan dance, Gore-tex, mountain, Navigation, Pen y fan, training. Bookmark the permalink.